There’s nothing in frontispiece to suggest a piece of anything, other than what confused English speakers have put there. The original sense in English was of the façade of a building, the decorated front that was designed to be imposing. It came from the French frontispice or the late Latin word frontispicium, both meaning a façade. The Latin word was made up of frons, forehead, plus specere, to look at, and so originally meant a view of the forehead. 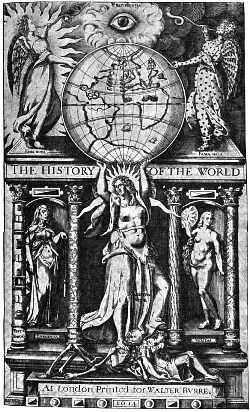 The title page of The History of the World by Sir Walter Raleigh, dated 1614, showing the ornate architectural styling of the time. You might think that this referred to the forehead being a clearly visible part of a person’s head, but it seems instead to have been connected with yet another of those weird methods of divination so common in classical times. It has another name, metoposcopy (from Greek words meaing “observe the forehead”); it’s the art of telling people’s character or fortune from their foreheads (another related term is physiognomy, judging character from characteristics of the face, which is also from Greek). The association of ideas seems to be that the façade of a building is as expressive as a person’s forehead. The word was borrowed into English around the end of the sixteenth century in the French form frontispice but no later than 1607 was also being used for the title page of a book. This may seem a large shift in sense, but the link lies in the practice of engraving a highly illustrated title page with all sorts of architectural detailing, such as columns and pediments. And it was at the front of the book, which helped the idea. By 1682, the word had taken on its modern sense of an illustration facing the title page of a book. And by then the folk etymologists had had their evil way with it, making a totally unwarranted association between front and piece and turning frontispice into our modern frontispiece. Last modified: 18 July 2009.